Landscape Supplies Company in Canberra | Wholesale Sleeper Co.
How a block retaining wall system can eliminate soil erosion and level out the ground to add value to your home or business while offering gorgeous landscapes and increase your useful space. We sell a variety of natural decorative stones which looks great in native plant or informal gardens. We even have a selection of granites and substrates to extend your utility areas and driveways. WE ARE OPEN EVERY DAY AND DELIVERIES AVAILABLE EVERY DAY. 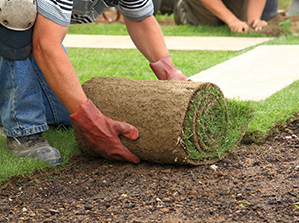 If you are looking for landscaping supplies for your outdoor design project or garden maintenance, it’s more than likely that you will require products such as soil, mulch, rock, sand, granite, cement, etc. Buying landscape materials by the bag from different suppliers can cost three to four times more than buying it in bulk. Canberra-based Wholesale Sleeper Company offers an extensive range of hardscape and gardening supplies under one roof. Contact us today and save money on your landscaping supplies. Commuting, frequent deliveries, handling and mark-ups on smaller quantities all add up, and you can end up paying a lot more in the end. It also becomes particularly difficult to keep track of all your supplies when you’re dealing with more than one shopping list. Save time and money on your landscaping supplies by buying your landscaping materials from Wholesale Sleeper Company. We take every opportunity to establish and foster a one-to-one relationship with all our clients. We strive to become your one-stop-shop for all your landscaping requirements in Canberra. Inject life into that old patch of grass with – landscape rocks and stones. These look great with native plants or in informal gardens. Enquire about our range of granites and substrates to extend your utility areas and driveways. You can save yourself a lot of time in the garden trying to rehabilitate the landscape if you purchase the correct mulch. We source only the best mulch for your garden, ensuring you have a wide range to choose from, to suit a variety of gardens. From Euci and forest mulch to Cypress pine and Cypress mulch, we have what you need to bring your garden back to vibrant life. Ensure all product is acceptable prior to commencement as no claims or responsibility will be accepted by the manufacture once the product has been installed. We do no take returns on over ordered products. We will collect empty pallets on job completion. Please ring when you have the empty pallets ready for pick up. Delineate areas in your garden and see a more refined landscape come to life, or protect certain areas from weathering with our range of pavers. Available in various sizes and styles, these pavers are versatile and durable and can be used for all forms of landscaping. We also stock budget pavers as part of our competitive pricing solutions. We are a Gold certified partner with Adbri Masonry products. After more than 15 years’ industry experience, we are one of the biggest facilities in Canberra, delivering the best products on time and within budget. You may find it hard to estimate how much to buy, especially if you’re are after cement, sand, rock, or topsoil. Our team will estimate and determine the accurate quantity that you require. If you bundle your order you can save even more money on the cost of delivery! Tell us what you need. We offer expert advice on the amount of landscaping materials you will need, based on the size of your landscape. Contact us today for an obligation-free quote, or visit us to chat about your requirements. Save yourself from driving around and get quantity discounts and lower delivery fees from us. You will also receive personal consultation from the original and best landscaping supply company in Canberra. Call today and one of our experienced landscaping specialists will talk with you to discuss your landscaping plans or use our quote form to drop us a line about your requirements and we will get back to you in less than 24 hours! NEED HELP WITH LANDSCAPING? ASK OUR LANDSCAPING SPECIALISTS. Address: 6 John Bull St.